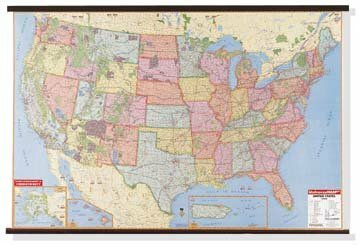 Bright, contrasting colors clearly identify political divisions on this Wall Map of the United States by Universal Map which measures 77" W x 54" H.
Physical map of the same area, with country borders and captions, as well as contoured blue oceans. Map Insets Include: Alaska, Hawaii, and Puerto Rico. A special feature of this map is the color coded states.